Our new location is 920 East Fry Boulevard. Due to HIGH volume of robo calls we get trying to sell us something we ask for you to please message on us FB if you have questions or wish to reach us. Love your place. (Just left a 5 star review on Yelp.) Would love it even more if you offered coconut milk. Thank You! Thank you for your review Jason. We may consider Coconut milk. Currrently we do offer Almond Milk and Soy Milk as alternatives. Thank you for your feedback. Would you/have you considered staying open until 5,or even later? I’m a photographer and would love to have a place to meet my clients to discuss details but considering work hours etc, we often need a place open later than 5. We have tried later hours without success 😦 It may happen in the future, but not right now. Thank you and keep the shutter going. This page still says you are closed on Sunday. I love your store, great products and always excellent service. I Steve. Glad I got to meet you. Curious to know, how would someone be able to apply to the company and what are the rules and restrictions on applying? If it’s a possibility.. 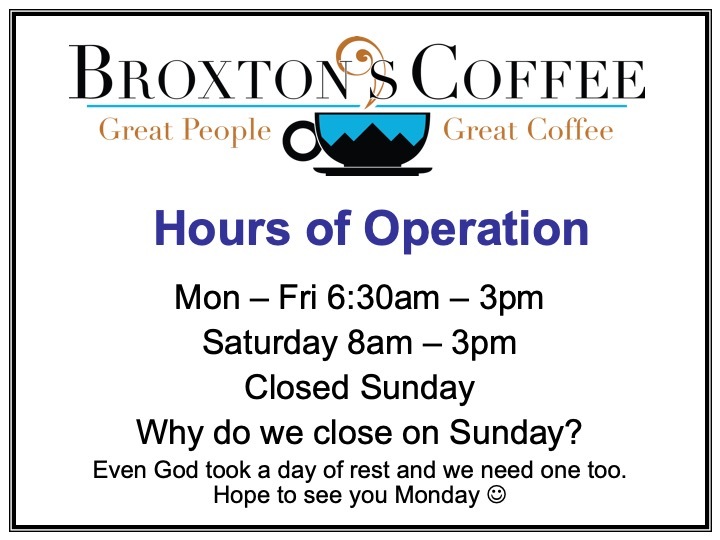 Please send a resume to broxtoncoffee@gmail.com. Thank you. I have never been there but now I know where you are. Do you ever have bagels? Hi Glenda, yes we do have bagels. We serve Dave’s organic bagels and we have cream cheese and butter available. Hello! I’m writing because I really like Broxtons, but I had a really bad experience there today. I came in at 10am on Saturday (the 10th). My order was taken by a blonde girl. Her custimer service was very lacking and seemed confused by my simple order of an iced coffee with coconut and mocha syrup. She laughed at me several times and passive aggressively belittled me as I attempted to order. Like I said, I really like Broxtons and it’s owner is an incredibly nice person. But this was so bad, I had to write about it. Honestly, there are too many coffee options in town for me to tolerate rude behavior. So, sadly, this will most likely be my last time buying from Broxtons. I hope that the young cashier learns from this and Broxtons treats it’s customers better. Hi Cierra and SORRY you had this experience with us. I can assure it will be addressed and I hope to see you in again soon, George.